US Secretary of State Rex Tillerson has suggested Venezuela may face a military coup. Mr Tillerson said the US was not advocating regime change and that he had no intelligence on any planned action. But he said that historically the military in Latin America has often intervened in times of serious crises. He was speaking at the University of Texas ahead of his Latin America tour. The secretary of state will visit Mexico, Argentina, Peru and Colombia, as well as Jamaica. Mr Tillerson joked that Venezuela's President Nicolás Maduro should seek refuge in Cuba. "If the kitchen gets a little too hot for him, I am sure that he's got some friends over in Cuba that could give him a nice hacienda [villa] on the beach," he said. "In the history of Venezuela and South American countries, it is often times that the military is the agent of change when things are so bad and the leadership can no longer serve the people," he said. Venezuela's Foreign Minister Jorge Arreaza criticised Mr Tillerson's comments and urged Latin American countries to unite against a common enemy. "Imperialism is our enemy. Trump goes against Mexico in the same way he attacks Venezuela and Central American immigrants", he said. "Imperialism doesn't respect anything," added Mr Arreaza, as he arrived in Havana for an official visit to Cuba. Mr Maduro is running for a second six-year term in elections due by the end of April. He has repeatedly accused the United States of leading an international plot to oust him and undermine the social programmes introduced by the socialist party since it came to power in 1999. Rather intriguingly Secretary Tillerson speculated about a possible military coup in Venezuela before heading off to check in with regional powers, although he offered no evidence his musings were backed by intelligence. His trip to Latin America is aimed at improving and strengthening relations south of the US-Mexico border, along which President Donald Trump wants to build a wall. But a key part of his agenda will be trying to rally support for Washington's tough line on Caracas. So far in the Western Hemisphere only Canada has followed the US lead in sanctioning loyalists of President Nicolás Maduro. But there is a coalition of about a dozen Latin America countries, known as the Lima Group, that agrees with US political messaging. Along with Washington it has rejected as undemocratic the Venezuelan government's decision to hold "snap" presidential elections. Most of the countries Mr Tillerson will be visiting belong to this group, so he will try to reinforce and build on that support. He will also discuss how to deal with the dire humanitarian situation. That will be a particular focus in Colombia, which is hosting hundreds of thousands of Venezuelan refugees. Mr Tillerson blames "the corrupt and hostile regime of Nicolás Maduro" for Venezuela's economic crisis. "It's a man-made collapse. Venezuela has the world's largest proven oil reserves. But Venezuelans are starving, dying of malnutrition and disease," he said. What has Venezuela's constituent assembly achieved? 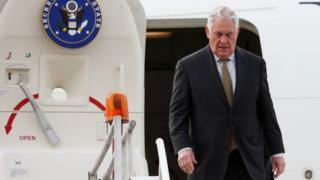 The US Secretary of State said he will keep putting pressure on Venezuela and its ally, Cuba, "to return to democracy". He praised sanctions Canada and the European Union recently imposed on senior Venezuelan officials over alleged human rights violations during anti-government protests. The US Secretary of State also warned about the growing presence of China and Russia in Latin America. He said this posed serious risks for the region. China's "state-led model of development" drains resources from Latin American countries and benefits mainly the Chinese people, he said. "Latin America does not need new imperial powers that seek only to benefit their own people," he added. He accused Russia of selling weapons to authoritarian regimes and described its increasing influence in the region was alarming.